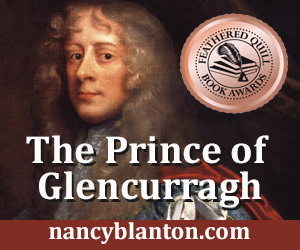 Sign up today on Goodreads and be eligible to win one of six free copies of The Prince of Glencurragh, my latest novel of 17th century Ireland. This book is a fast-paced adventure filled with action, romance, intrigue and terrible obstacles. Here's a piece from the hard cover book flap: Is it possible to reclaim a dream once it is lost to the mists of memory? Aengus O’Daly is what every good storyteller should be: observant, thoughtful, and inspired by love. He tells the story of his best friend Faolán Burke, both valiant and true, who tries to restore the world of his father’s dreams. Had he lived to build it, Sir William Burke’s Castle Glencurragh would have been a wonder to all who beheld it. But when he died, all that remained of the castle were a few scattered stones and the indelible image in the mind of his ten-year-old son. But in 1634 as the boy comes of age, the real world is not the one Sir William knew. As the English plantation system spreads across the province of Munster, Irish families will lose their homes unless they accept the Protestant faith. Farms that have been in their families for centuries now are given to English soldiers as rewards for service. With his whole being, Faolán believes all can be made right again, with perseverance, his love by his side, and with the right and perfect plan. The Giveaway ends September 10, 2016.